Not sure what to do with your leftover pumpkin from Halloween? Try this delicious Pumpkin Sabzi this holiday season. 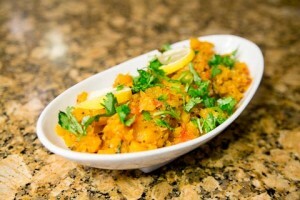 It’s a great Indian Vegetarian recipe to share with family and friends. Add corn oil to stove on high heat. Add cumin seeds and mustard seeds. Cook for about 30 seconds. Add crushed red chili peppers. Add curry leaves. Cook for another 30 seconds. Add pumpkin. Mix and stir well so spices are spread evenly. Cook for 1 minute. Lower heat to medium low. Cook for another 30 minutes. Stir occasionally. Add water, tomatoes, and salt. Cook for another 5-7 minutes with lid covered. Once tomatoes are half cooked, stir again. When tomatoes are cooked and the pumpkins are cooked, then mash the pumpkins. You’ll know the pumpkins are cooked because the color will change and it will mash easily. Raise the heat to high. Without lid, cook for another 3-5 minutes to evaporate excess water. Turn off stove. Add green chili, mint, and cilantro. Squeeze lemon on top.